Finding a new career is one of the most important things that helps Veterans make a successful transition from military to civilian life. The Helmets to Hardhats program, led by Canada�s Building Trade Unions, will help connect Veterans, Canadian Forces members and reservists to careers within the construction industry, including apprenticeships in various building trades. Veterans Affairs Minister Steven Blaney said the Government of Canada�s contribution of $150,000 to support Helmets to Hardhats in Canada will help those who are interested in a career in the construction industry. Over the course of their careers, members of the Canadian Forces develop a wide range of skills, many of which are extremely valuable in the building trades. Helmets to Hardhats will help Veterans match those skills with jobs in the construction industry. The program will also provide employers and local unions with access to a talented labour pool to fill positions from engineering jobs to trade employment contracts and apprenticeships. Helmets to Hardhats will be a fully bilingual service that can be accessed by telephone or online. �This program is already extremely successful in the United States. We have every reason to believe that it will be extremely successful here in Canada,� said Minister Blaney. 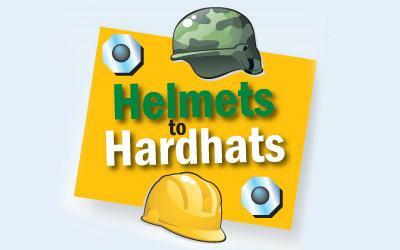 If you are interested in the Helmets to Hardhats program in Canada, please contact Canada�s Building Trades Unions, 130 Albert Street, Suite 1902, Ottawa, ON K1P 5G4, visit www.buildingtrades.ca or call 613-236-0653. Attached is the Canadian Building Trades Business Plan for the Helmets to Hardhats program. The program is expected to be fully operational by January of 2013. UA has been a strong supporter of our Veteran's and is looking forward to participating in this program for years to come.